The child swap from yesterday resulted in lots of fun and four tired out girls. To make the swap back we went to Jan & Doc's house to swim for a while. It was fun to be back at our temporary home and visit with Michelle and Jan. 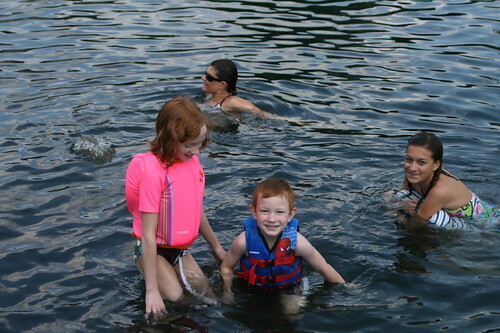 The kids enjoyed playing with the neighbors' dogs and splashing around in the lake. I never got a picture of all five kids together. This will have to do.